No pizza, or pasta, or bread? OH MY! If you're someone that continually gets my references/puns, I appreciate you. Dig Inn may still be considered the new kid on the Copley Square block, but it's been incredibly popular since it opened last summer. The menu revolves around what's in season, and everything that contains gluten is labeled (among other common dietary restrictions). Some of my favorite GF options on the menu right now include the brussels sprouts with maple & sriracha, roasted sweet potatoes, and grilled apples (also the brown rice and chicken are always fantastic). I've realized asian cuisines can be difficult because a lot of sauces sneakily contain gluten, but Wagamama has a great GF menu. I'm a big fan of both the chicken and prawn itame, and am looking forward to venturing into the ramen and lettuce wraps. I can't image they'd disappoint! Just because you can't have traditional pizza doesn't mean you won't crave it. Papa Razzi on Newbury Street has not one, but multiple GF pizza AND pasta options. Don't worry, it doesn't taste like cardboard. To be honest, it tastes so similar to the real thing that I had wondered if they mixed up my order (they didn't). If you didn't already love Thinking Cup enough, let it be known that there is quite a selection of gluten-less treats like tiramisu, snickerdoodles, and chocolate chip cookies. They also have GF bread on hand for gooey grilled cheese sandwiches. 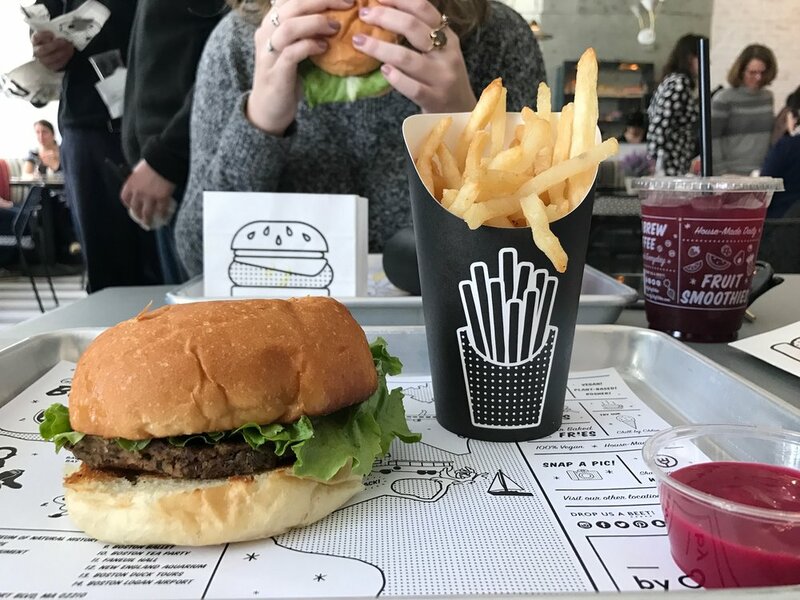 New to Boston's Seaport, by CHLOE is an all vegan restaurant that happens to be quite GF friendly. All salads and pastas can be made GF upon request, and both the classic and guac burgers can be made on a GF bun. I've tried the guac burger, quinoa taco salad, and the french fries -- all of which were amazing. Keep your eye out for the Fenway location opening later this spring!